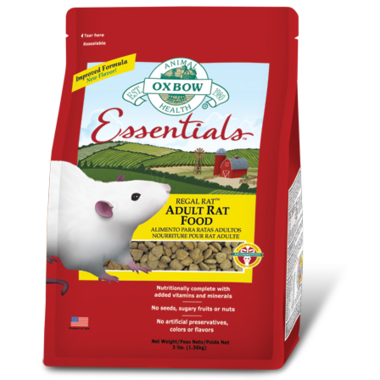 Oxbow Essentials Adult Rat Food is a low-fat, nutritionally-balanced food that improves the quality of life for adult pet rats without causing life-threatening obesity. The complete, stabilized kibble contains 100% of a rat’s daily essential nutrients and prevents selective feeding, common with seed and fruit-based diets. This rat food was formulated by a team of professionals in the laboratory animal science, zoo nutrition and wildlife nutrition fields.